The recent demise in California of legislative bill SB-1454 took some by surprise. This cleverly written piece of legislation was designed supposedly to clarify misleading labeling claims and would prevent the sale of plastics in California whose packaging is labeled not only biodegradable but also compostable. But the bill’s backers were stunned when California’s Governor Schwarzenegger vetoed the bill, noting the possible “unforeseen consequences could result from such a vast expansion” of existing law. For more on this, see http://3.ly/aQ3W. The prestigious panel was comprised of 2 Nobel Peace Prize recipients, a former NASA advisor, several CEO’s of noted alternative energy companies, a top executive of Pacific Gas & Electric, and the leader of the carpenters’ union. During his address, the Governor mentioned his recent discussion and commitment to California leading the way in alternative energy usage by powering 5 major government buildings completely with fuel cells, though no target date for this was given. This announcement was met with excitement and resounding applause from attendees. 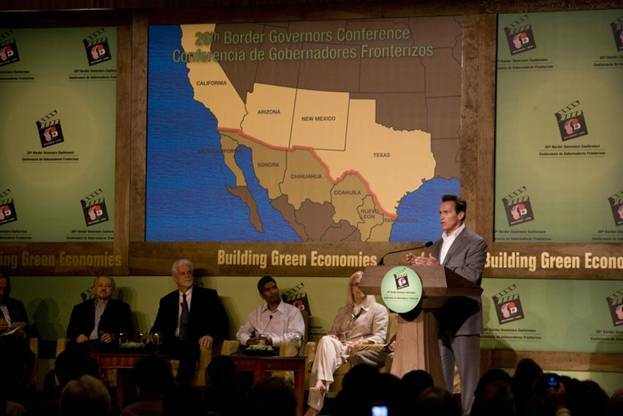 Acknowledging the importance and need for border states to “help each other”, the governor then introduced the 6 panelists and turned the discussion over to moderator Terry Tamminen, Director of the North America Foundation’s Climate Policy Program and a former Secretary of the Environmental Protection Agency.